Most vaccines help prevent disease by mimicking the immune system's natural response to infection. In the body, cells called macrophages engulf invading microbes, such as viruses, and sound the alarm by showing pieces of the invader to T cells and B cells. B cells produce defensive molecules called antibodies that "stick" to the microbes, making them unable to multiply and cause disease. Credit: National Institute of Allergy and Infectious Diseases. A vaccine is a preparation given to induce immunity against an infectious disease. It works by sensitizing the body's immune system to a particular disease-causing bacterium, bacterial toxin, or virus. If the particular infectious agent invades the body at a later time, the sensitized immune system quickly produces antibodies, which help destroy either the agent itself or the toxin it produces. The word "vaccine" comes from the Latin vaccinus, which means "pertaining to cows." The first vaccine was based on the relatively mild cowpox virus, which infected cows and people. As discovered by Edward Jenner, this vaccine protected people against the related, but much more dangerous, smallpox virus. The human immune system is a complex network of cells and organs that evolved to fight off infectious microbes. Much of the immune system's work is carried out by an army of various specialized cells, each type designed to fight disease in a particular way. The invading microbes first run into the vanguard of this army, which includes white blood cells called macrophages (literally, "big eaters"). The macrophages engulf as many of the microbes as they can. How do the macrophages recognize the microbes? All cells and microbes effectively wear a uniform made up of molecules that cover their surfaces. Each human cell displays marker molecules unique to each individual. Microbes display different marker molecules unique to them. The macrophages and other cells of the immune system use these markers to distinguish among the cells that are part of the body, harmless bacteria that reside in the body, and harmful invading microbes that need to be destroyed. The molecules on a microbe that identify it as foreign and stimulate the immune system to attack it are called antigens. Every microbe carries its own unique set of antigens, which are central to creating vaccines. Macrophages digest most parts of the microbes but save the antigens and carry them back to the lymph nodes, bean-sized organs scattered throughout your body where immune system cells congregate. In these nodes, macrophages sound the alarm by "regurgitating" the antigens, displaying them on their surfaces so other cells, such as specialized defensive white blood cells called lymphocytes, can recognize them. 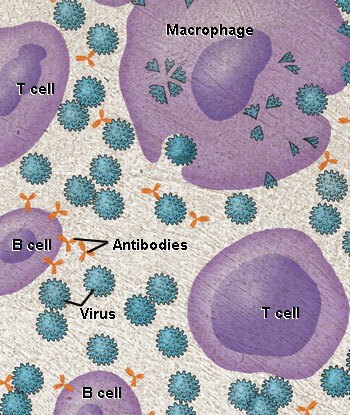 There are two major kinds of lymphocytes, T cells and B cells, and they do their own jobs in fighting off infection. T cells function either offensively or defensively. The offensive T cells don't attack the microbe directly, but they use chemical weapons to eliminate the human cells that have already been infected. Because they have been programmed by their exposure to the microbe's antigen, these cytotoxic T cells, also called killer T cells, can sense diseased cells that are harboring the microbe. The killer T cells latch onto these cells and release chemicals that destroy the infected cells and the microbes inside. B cells make and secrete extremely important molecular weapons called antibodies. Antibodies usually work by first grabbing onto the microbe's antigen, and then sticking to and coating the microbe. Antibodies and antigens fit together like pieces of a jigsaw puzzle – if their shapes are compatible, they bind to each other. Each antibody can usually fit with only one antigen. The immune system keeps a supply of millions and possibly billions of different antibodies on hand to be prepared for any foreign invader. It does this by constantly creating millions of new B cells. About 50 million B cells circulate in each teaspoonful of human blood, and almost every B cell – through random genetic shuffling – produces a unique antibody that it displays on its surface. Vaccines teach the immune system by mimicking a natural infection. For example, the yellow fever vaccine, first widely used in 1938, contains a weakened form of the virus that doesn't cause disease or reproduce very well. Human macrophages can't tell that the vaccine viruses are weakened, so they engulf the viruses as if they were dangerous. In the lymph nodes, the macrophages present yellow fever antigen to T cells and B cells. Live, attenuated vaccines contain a version of the living microbe that has been weakened in the lab so it can't cause disease. Because a live, attenuated vaccine is the closest thing to a natural infection, these vaccines are good "teachers" of the immune system: They elicit strong cellular and antibody responses and often confer lifelong immunity with only one or two doses. Despite the advantages of live, attenuated vaccines, there are some downsides. It is the nature of living things to change, or mutate, and the organisms used in live, attenuated vaccines are no different. The remote possibility exists that an attenuated microbe in the vaccine could revert to a virulent form and cause disease. Also, not everyone can safely receive live, attenuated vaccines. For their own protection, people who have damaged or weakened immune systems – because they've undergone chemotherapy or have HIV, for example – cannot be given live vaccines. Another limitation is that live, attenuated vaccines usually need to be refrigerated to stay potent. If the vaccine needs to be shipped overseas and stored by health care workers in developing countries that lack widespread refrigeration, a live vaccine may not be the best choice. Live, attenuated vaccines are relatively easy to create for certain viruses. Vaccines against measles, mumps, and rubella (MMR), chickenpox, yellow fever, and poliomyelitis, for example, are made by this method. Viruses are simple microbes containing a small number of genes, and scientists can therefore more readily control their characteristics. Viruses often are attenuated through a method of growing generations of them in cells in which they do not reproduce very well. This hostile environment takes the fight out of viruses: As they evolve to adapt to the new environment, they become weaker with respect to their natural host, human beings. Live, attenuated vaccines are more difficult to create for bacteria. Bacteria have thousands of genes and thus are much harder to control. Scientists working on a live vaccine for a bacterium, however, might be able to use recombinant DNA technology to remove several key genes. This approach has been used to create a vaccine against the bacterium that causes cholera, Vibrio cholerae. Scientists produce inactivated vaccines by killing the disease-causing microbe with chemicals, heat, or radiation. Such vaccines are more stable and safer than live vaccines: The dead microbes can't mutate back to their disease-causing state. Inactivated vaccines usually don't require refrigeration, and they can be easily stored and transported in a freeze-dried form, which makes them accessible to people in developing countries. Most inactivated vaccines, however, stimulate a weaker immune system response than do live vaccines. So it would likely take several additional doses, or booster shots, to maintain a person's immunity. This could be a drawback in areas where people don't have regular access to health care and can't get booster shots on time. Cholera, typhoid fever, pertussis, rabies, and influenza vaccines contained killed organisms. Instead of the entire microbe, subunit vaccines include only the antigens that best stimulate the immune system. In some cases, these vaccines use epitopes – the very specific parts of the antigen that antibodies or T cells recognize and bind to. Because subunit vaccines contain only the essential antigens and not all the other molecules that make up the microbe, the chances of adverse reactions to the vaccine are lower. They can grow the microbe in the laboratory and then use chemicals to break it apart and gather the important antigens. They can manufacture the antigen molecules from the microbe using recombinant DNA technology. Vaccines produced this way are called "recombinant subunit vaccines." A recombinant subunit vaccine has been made for the hepatitis B virus. Scientists inserted hepatitis B genes that code for important antigens into common baker's yeast. The yeast then produced the antigens, which the scientists collected and purified for use in the vaccine. Research is continuing on a recombinant subunit vaccine against hepatitis C virus. For bacteria that secrete toxins, or harmful chemicals, a toxoid vaccine might be the answer. These vaccines are used when a bacterial toxin is the main cause of illness. Scientists have found that they can inactivate toxins by treating them with formalin, a solution of formaldehyde and sterilized water. Such "detoxified" toxins, called toxoids, are safe for use in vaccines. When the immune system receives a vaccine containing a harmless toxoid, it learns how to fight off the natural toxin. The immune system produces antibodies that lock onto and block the toxin. Vaccines against diphtheria and tetanus are examples of toxoid vaccines. If a bacterium possesses an outer coating of sugar molecules called polysaccharides, as many harmful bacteria do, researchers may try making a conjugate vaccine for it. Polysaccharide coatings disguise a bacterium's antigens so that the immature immune systems of infants and younger children can't recognize or respond to them. Conjugate vaccines, a special type of subunit vaccine, get around this problem. When making a conjugate vaccine, scientists link antigens or toxoids from a microbe that an infant's immune system can recognize to the polysaccharides. The linkage helps the immature immune system react to polysaccharide coatings and defend against the disease-causing bacterium. The vaccine that protects against Haemophilus influenzae type B (Hib) is a conjugate vaccine. Once the genes from a microbe have been analyzed, scientists could attempt to create a DNA vaccine against it. Still in the experimental stages, these vaccines show great promise, and several types are being tested in humans. DNA vaccines take immunization to a new technological level. These vaccines dispense with both the whole organism and its parts and get right down to the essentials: the microbe's genetic material. In particular, DNA vaccines use the genes that code for those all-important antigens. Researchers have found that when the genes for a microbe's antigens are introduced into the body, some cells will take up that DNA. The DNA then instructs those cells to make the antigen molecules. The cells secrete the antigens and display them on their surfaces. In other words, the body's own cells become vaccine-making factories, creating the antigens necessary to stimulate the immune system. A DNA vaccine against a microbe would evoke a strong antibody response to the free-floating antigen secreted by cells, and the vaccine also would stimulate a strong cellular response against the microbial antigens displayed on cell surfaces. The DNA vaccine couldn't cause the disease because it wouldn't contain the microbe, just copies of a few of its genes. In addition, DNA vaccines are relatively easy and inexpensive to design and produce. So-called naked DNA vaccines consist of DNA that is administered directly into the body. These vaccines can be administered with a needle and syringe or with a needle-less device that uses high-pressure gas to shoot microscopic gold particles coated with DNA directly into cells. Sometimes, the DNA is mixed with molecules that facilitate its uptake by the body's cells. Naked DNA vaccines being tested in humans include those against the viruses that cause influenza and herpes. Recombinant vector vaccines are experimental vaccines similar to DNA vaccines, but they use an attenuated virus or bacterium to introduce microbial DNA to cells of the body. "Vector" refers to the virus or bacterium used as the carrier. In nature, viruses latch on to cells and inject their genetic material into them. In the lab, scientists have taken advantage of this process. They have figured out how to take the roomy genomes of certain harmless or attenuated viruses and insert portions of the genetic material from other microbes into them. The carrier viruses then ferry that microbial DNA to cells. Recombinant vector vaccines closely mimic a natural infection and therefore do a good job of stimulating the immune system. Attenuated bacteria also can be used as vectors. In this case, the inserted genetic material causes the bacteria to display the antigens of other microbes on its surface. In effect, the harmless bacterium mimics a harmful microbe, provoking an immune response. Researchers are working on both bacterial and viral-based recombinant vector vaccines for HIV, rabies, and measles. Vaccines are usually given by injection into the upper arm. Oral polio vaccine is given on a sugar lump or by drops on the tongue. Some vaccines require several doses, spaced some weeks apart; others require only one dose. The effectiveness of vaccines varies from near total protection in most cases, to only partial or weak protection (for example, against typhoid fever or cholera). The duration of effectiveness also varies from a few months to lifelong.